We recently asked readers to tell us how they are bringing about a change in India even as they grapple with their education and workplace matters. rediff.com celebrates the sincere spirit of these young Indians in a new series which begins today with IIT-Madras graduate Apoorve Dubey. "I aspire to make a difference in the lives of people around me," says Apoorve Dubey, who at 26 delivers motivational lectures in schools and colleges, works as a software engineer with Symantec and has also written a book The Flight Of Ambition. "No, I may not be able to change the world. But that should not stop me from changing someone's world," says the IIT-Madras graduate, who also volunteers with the Akshar Bharti programme, an initiative meant for taking quality education to the underprivileged masses. The programme, which began two years ago, has about 140 libraries across the country. Apoorve is also an executive member of the Kalinga Kusum Foundation which addresses rural education via vocational centres. When you ask him how it all began he recalls his days at IIT-Madras. "A friend took me to a small house close to our campus where a couple lived with some 20 children!" he says. "Most of them were between two and 14. As I wondered why they had so many children when they clearly couldn't take care of them, the friend mentioned that all but two of the kids were adopted!" All of them, Apoorve says, spoke Tamil, a language he did not speak nor understand. Yet he could feel a deep sense of filial bonding. "I was shocked to learn that it was an orphanage. The couple had two children; the rest of them had nowhere to go. But all of them stayed like a family. It was difficult to distinguish between the couple's real children and the adopted ones. Muthukumar and his wife Kala treated each of them as their own," he says. The way the couple treated the adopted kids left an indelible impression on Apoorve. It was then that he made up his mind to make a difference to society. Whenever he is asked what inspired him to write The Flight of Ambition, images of that small house in Chennai flash before his eyes. The other person who left a lasting impact was a mathematics teacher at school. "Towards the end of his lecture," Apoorve says, "the topic of discussion would invariably drift towards the greatness of India. You knew he was genuine and wasn't making things up. When we were passing out, we asked him what we could do for the country." The teacher had a very practical answer: "He told us to simply be honest and do our job in the best manner we could. 'Don't think too big; just look around you and you will have plenty of problems to solve. If you don't fix the problem, no one else will', he said." "It is imperative that we look to eradicate the problems that we see around us and look beyond narrow boundaries of religion and region," says Apoorve. Having set up knowledge centres and libraries, Apoorve Dubey now plans to set up medical aid facilities. "We are collaborating with some doctors and will conduct health workshops. Providing medical aid, especially to the rural areas, is very important." 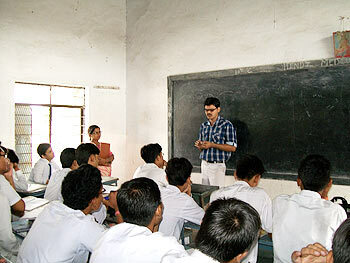 He is busy reaching out to young minds through seminars in schools and colleges to catch 'em young. "Kids are very receptive. Their minds are fertile. I am planting seeds and I am convinced each and every individual will shine like a star." Would you like to share your story with us? Tell us how you are following your heart while doing your bit for society. If you are under 35 years of age then write to us at getahead@rediff.co.in with the subject line: 'I'm following my heart' along with your name, age and photograph.